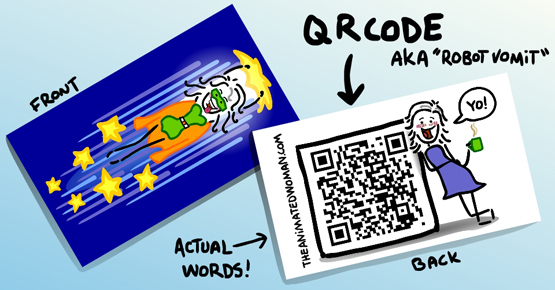 The Animated Woman: QR Codes and STUFF. Yeah. I am jealous of your creativity. That is quite literally the bossest business card I have ever seen. Awesome! Gawd I love your QR code. JW - I can't hold a candle to your wordsmithery! I totally want one of your cards just to show off how cool I am! (cause having your card would up my cool points by 10000) What does one have to do to get one of your cards? I love the business cards!! They're pretty cool! 24-7-365 mom - Wow! I guess one would have to meet me in real life...er? TechyDad - You crack me up. Have you ever won a free lunch that way? I love the simplicity of the design on your business card. Yet, at the same time I think you've placed too much trust in using a OR code. Especially since you're just using it to take someone to your your main site. It may be redundant, but I would use both text to spell the website name and a QR code perhaps to take someone to specially crafted welcome page. CuteMonsterDad - I think you have a point for someone trying to get actual "business" through their business card; a specially crafted welcome page is a great idea. But I just want to promote the blog as a place of entertainment and fun, so the main site URL works better than a welcome page. If you were going to FunnyorDie.com, you wouldn't want to go to a welcome page first, you'd want to get straight to the funny. Am I right? I did use text to spell the website name though, see where it says "actual words!" and I recommend folks do that too.